Ciro Marchetti is a graphic designer and illustrator devoted to painting a pretty picture that will jump start your imagination. He has found his niche in the divine and fantastic, trying to add in some elements of reality for credibility and personal resonance. His work speaks for itself with the immensity of its success. 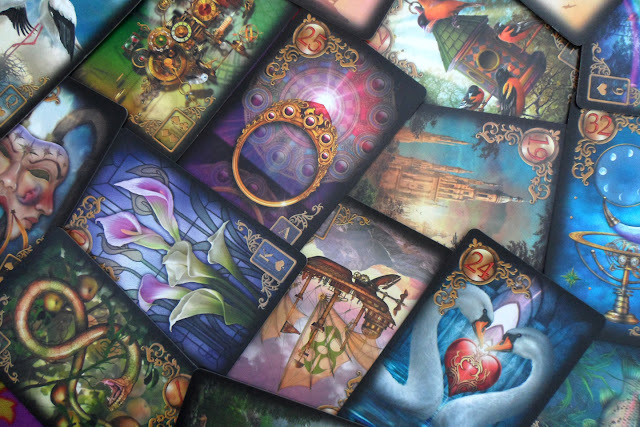 I don't doubt you have seen it displayed in the Gilded Tarot, the Legacy of the Divine Tarot, the Tarot of Dreams, the Oracle of Visions, and the Gilded Reverie Lenormand. What a line of work! I have collected them all. While his decks have been released in limited editions for collectors and fans, many of his works are available through Llewellyn for those on a budget. If you missed out on his print runs of Legacy of the Divine, you can still find the mass market one on shelves and on the internet. It's a great place to start! The last installment to Ciro Marchetti's series of greatness is a 36 card deck known as a Lenormand. It's a combination of oracular cartomancy to bring you simple (or elaborate and intricate) readings. You can choose the spread that works best for your needs. The simplest spreads for the Lenormand are in pairs of two. I prefer pairs over just one card, since the one card is literally like a word in the sentence. You ask a question and your answer will be quite brief. 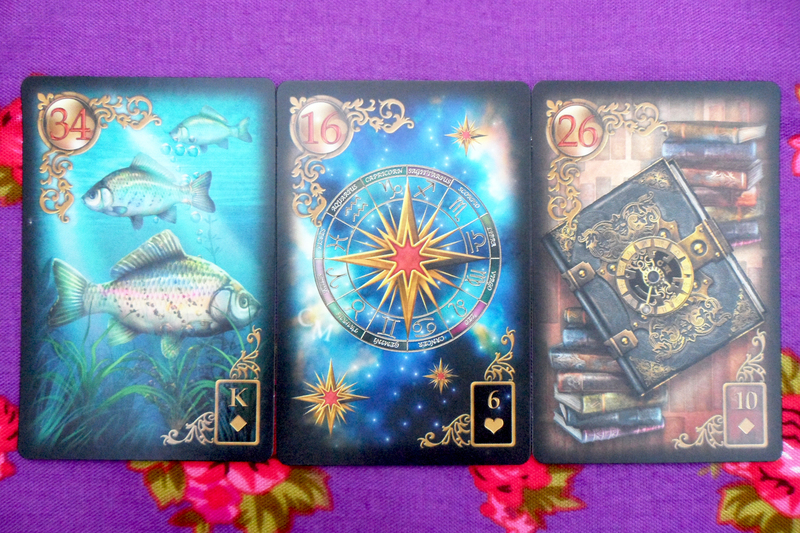 With two complimenting or opposing cards, you can find a direction to go in or to avoid. It gives you a little more to work with, depending on your needs. The point of learning the Lenormand — at least from what I have seen, — is to work with the Grand Tableau. 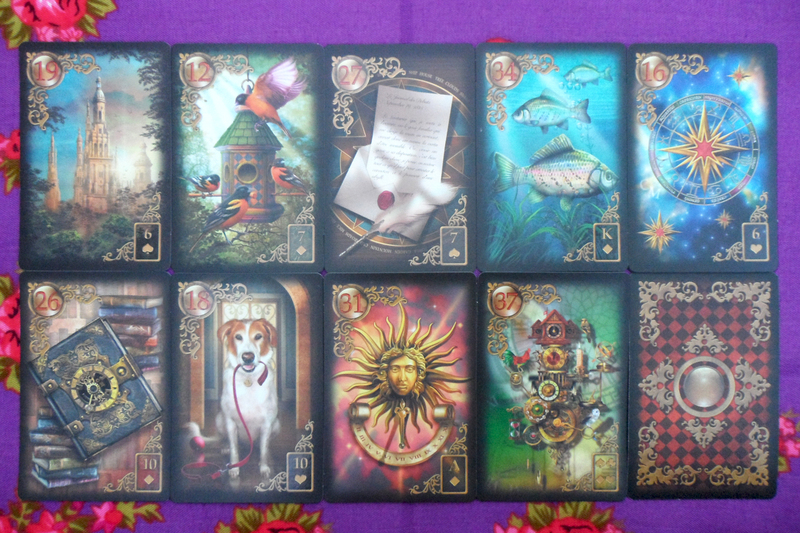 It is an elaborate spread that contains all of the 36 cards of the deck. 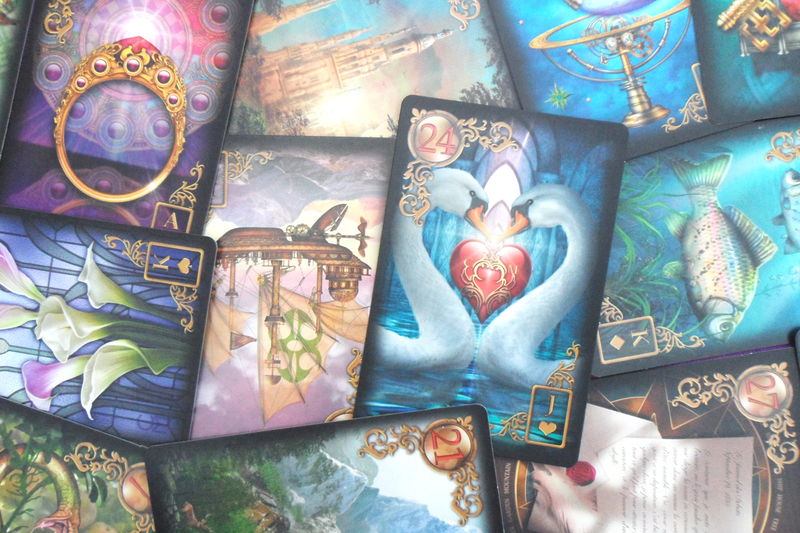 If your deck has extra cards, you could delight in adding them to bring a little extra magic to your readings. Ciro's creations are nice and can prove to be quite useful, but if you prefer the traditional 36 and nothing more, that's fine too. There is so much versatility in this way and that. The leeway is due to the fact that the cards are quite versatile, and as he designed this deck, he thought to add two signifier cards for men and women. That's a lot of consideration for modern-day needs. Every reader can choose a traditional school or none at all. 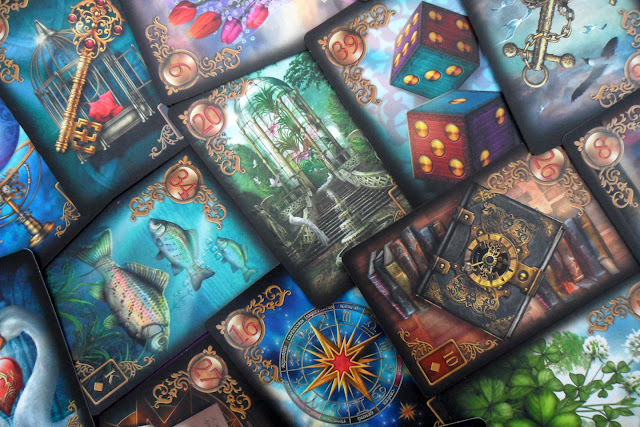 Throughout the years of Lenormand card study, I have seen others combine the school and add their own personal touch for readings that prove both riveting and enlightening. The point is to experiment until you find the method that is right for you. The most appealing aspect of the Gilded Reverie Lenormand is the way that it was rendered. It comes with Ciro Marchetti's signature style: vivid colors, minuscule details complimented with fine lighting. It has fantastical elements mixed in with reality. It's just a new way to look at Ciro's artwork. He chose not to depict a simple tree or a plain coffin even though many insisted that is how Lenormand works. He said there would be no point in making a Lenormand if he couldn't add some of his own ideas to the plethora that already exists, and while many argued about it, I think the end result is quite beautiful. All he had to do was shut out people's contradictory opinions and focus instead on the masterpiece he was making. It is worth noting that I followed the progress of the Gilded Reverie ever since it was in the beginner stages. I participated in the dialogue every time he posted a round of three options to choose from. He always mixed and matched, and listened to what people had to say about his work. A lot of times there were heated conversations amongst admirers. 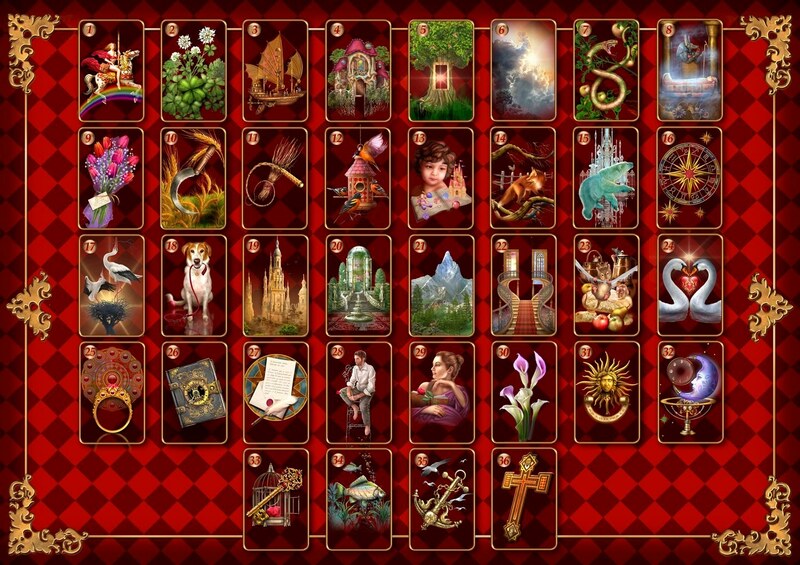 They are very aware of what works and what doesn't according to them in a Lenormand deck and were more than willing to share the wealth of their knowledge. I think Ciro's style was cut out for the Lenormand all along. It takes a system that is simple and that works and adds a little modern beauty to it. That is exactly what we needed. My biggest contribution to the deck was in recommendations for the number placement / look! Tower. A big business or established project. It's hard for a tower to expand, so it does have its boundaries or its restrictions. This shows the culmination of a project, as the cherry on top. It popped up unexpectedly but took the world of cards by storm. Birds. How chatty! Birds are a conversation established. It can be fast paced and excited, maybe a little jittery and nervous. It could be gossip or it could also be chatting through social networks. A common interpretation could be text messages or Twitter, depending on what it is combined with. Letter. Letters can be ornate but they can also be quite simple. It stresses the fact that it delivers a message, but the message needs somebody to deliver it. This card is very literally a piece of paper that has a message, but if combined with the book card can be a diary or a secret that is being delivered. Like a letter, it is a very intimate dialogue. Fish. Capitalize! The fish are a great signifier for work. This is my line of work, — and I love it! —It is a big investment for a means of finance, but it looks like once the technique is mastered, it can be used as a powerful tool. Stars. Quite literally drawing connections and networking. This card stands for lucidity, psychic development, wishes, metaphysics, astrology, and the zodiac. Stars are seen as hope in the tarot and light, it could also be literally a night sky or stars. Book. Secret for now. Books are content written, and I feel that it could mean to journal about the development of the relationship. It can also represent school or higher education, which is a very personal approach of mine towards the tarot and oracles surrounding it. 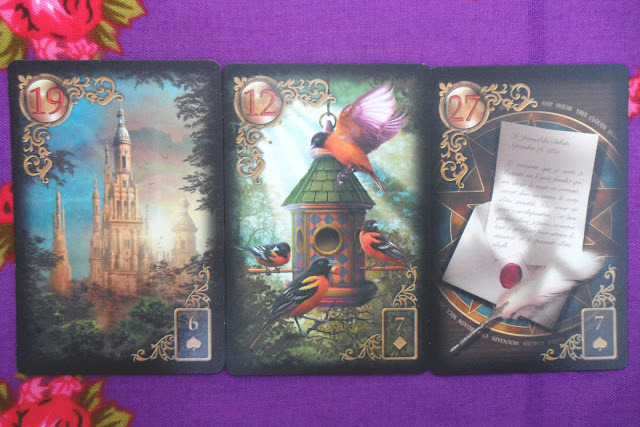 The Lenormand is another school of divination; one I am very comfortable with and learning with speed. Write a book about it, publish something! Yes sir! Dog. A loyal friend. This card is heart-warming. I would not say it is the most beautiful one, but I can admit that it is sweet. It can be a faithful person or quite literally a pet. I take this to be a good sign that I can work with this deck and that we will get along just fine... unlike a certain deck I interviewed not too long ago. Sun. Success! So much light and warmth that comes from the sun. When you enjoy what you do, it really shows in yourself and in the others you contaminate with your joy. It is the brilliance of light as it stretches through the sky, through a place. It looks like a great card to signify, even though I like to stick to the Moon. Clock. 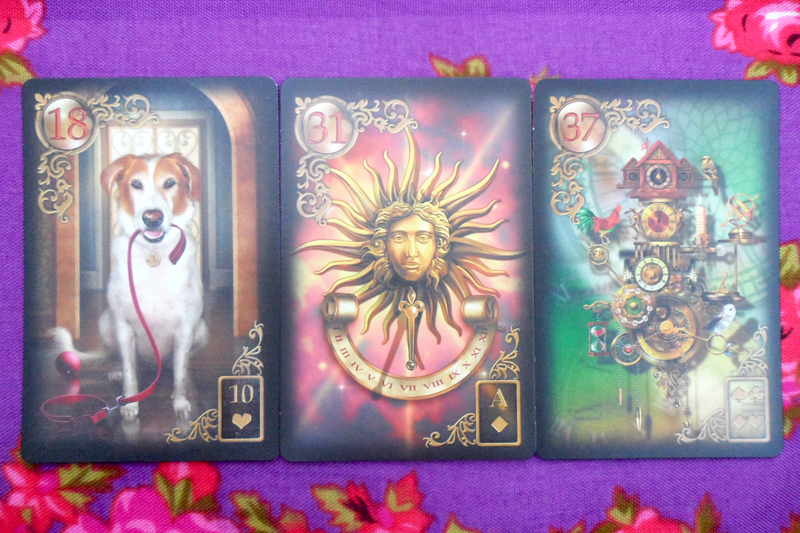 This is one of Ciro Marchetti's personal contributions to the Lenormand. It's quite kooky, but it is a vessel that chimes at a certain time. It could just be a measure of progress and how long it takes, but it could also note a vivid alarm or wake-up call. ☆ 1st: what's most important? (for instance, Mask could suggest that the 'masked' Houses are extra important). ☆ 2nd: an obstacle - something that could get in the way of a clear interpretation or resolution. ☆ 3rd: hidden wisdom, a teaching. ☆ 4th: moving on (Time indicates patience: it will take time before things will be resolved; Mask would say something significant in the future is still unknown; Dice - take a random chance; Bridge - Yes, now's the time to move on). So much beauty! Would you like me to explain how I read the Lenormand in a GT? I'd love to share. I own this deck too and it will be a great pleasure for me to read you on your Grand Tableau ways of reading. Thank you, enjoy your deck! Nice blog!! Astrology contains a number of belief systems which holds that there is a correlation between astronomical phenomena and events in the human world.The base of the astrology is the study of the movement of Sun’ Moon’ Planets and the Stars and their influence on the earth and its beings. Truth being hidden or concealed. Happiness being masked. Fortune being misread. What did you ask the cards? I would be happy to help you interpret the card draw.